Mara did not jump into a love of reading at an early age. Being read to, sure, and being told stories…always and without end. But not reading on her own. This is something I’ve had to work hard to accept as a parent, and especially as a parent who, in the days before dishes and laundry whelmed my life o’er, was once an avid reader. Mara can read very well when she wants to, and in the two or three months since Angela gave her a booklight her normal bedtime behavior after lights out has gradually shifted from playing in the dark with dolls and horses to reading books. It’s so quiet in there we think she’s fallen asleep, but she’s reading. At various times in the past she has occupied herself in bed with books, but mostly it was looking at pictures. She never liked slogging through big blocks of text. Her favorite books were the critically acclaimed graphic novel series, Bone, by Jeff Smith. Lots of evocative imagery (much of it rather scary for a seven- or eight-year-old, I’d have thought), and minimal text, all of it dialog. While the Bone books will always occupy a revered place on our bookshelf (I fell in love with them after an initial revulsion based on a quick flip-through), Mara has lately moved on to Barbara Park’s Junie B. Jones and other text-heavier books. One day recently I felt like sitting and relaxing. I considered checking my social pipeline — email and facebook, blogs — because it’s easy and it’s what I do almost without thinking. Then I thought, my daughters almost never see me sit and read during the day, during their day, when they are awake and busy and in the house. 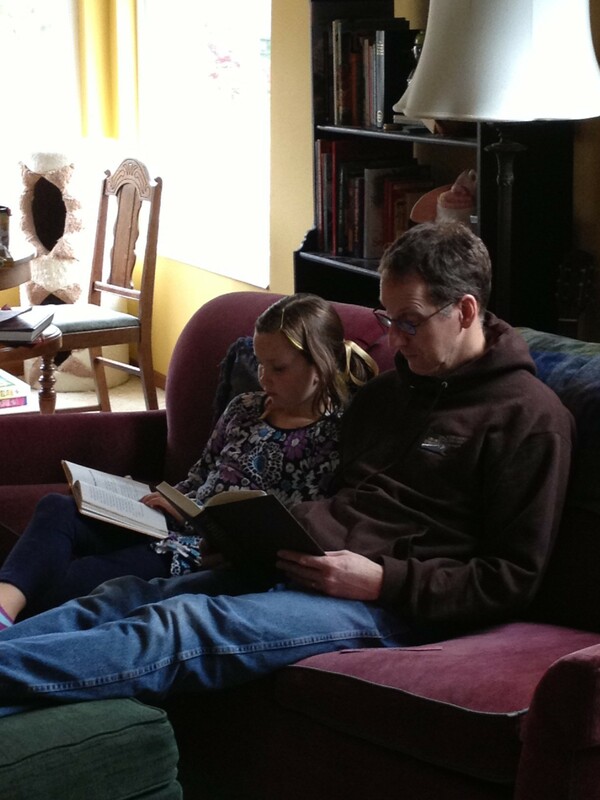 There is probably not a picture in their heads of “dad reading a book”, even though the image of “dad’s attention being sucked up by the computer or the smart phone” is doubtless permanently branded on their brains. How will they ever develop a love of just sitting down with a good book if they never see what that might look like? Mara was working on her new Ravensburger 300-piece puzzle of puppies, kittens and hamsters. Miji (yes, Emilia’s nickname continues to evolve) was at her Legos on the floor. Angela was busy answering work emails. I went and fetched Timothy Egan’s biography of photographer Edward Curtis, Short Nights of the Shadow Catcher, one of the books I’ve been picking at for months, and settled onto the couch for a spot of good old-fashioned reading. In a trice, Mara left her puzzle, fetched her copy of Jeff Kinney’s Diary of a Wimpy Kid*, and cozied up next to me. Angela was quick with the camera. It was a moment that I’ve waited for for a long time. A little parallel book time on the couch. Mara may not become one of those teenagers that’s always slouched in a chair upside down reading a book, or one of those people who read while walking along sidewalks and crossing busy streets. That’s okay with me. She’s not playing computer games all day or watching TV. She likes to run, climb and hang from things. She’s a healthy kid in all ways. But sitting there side by side, I reading my biography of Curtis and my daughter reading (silently, not sounding out words or whispering or mumbling, which would have been okay, too) about the travails of the wimpy kid… well it just felt like a little piece of heaven. *I actually disenjoy some of the attitudes expressed in the Wimpy Kid books, such as references to certain boys “getting all the girls”, which, when I was reading out loud to Mara, forced us to stop and have a conversation about what she thought that might mean and whether or not that was a constructive way to approach society. Nevertheless, the books have the right picture/text ratio and Mara seems engaged by the protagonist’s plight, and anyway I prefer discussion over outright censorship, which is not to say that I don’t reserve the right to exercise the latter at any time and without having to justify myself. Selah. Just past Issaquah on Interstate 90, where the old highway curves up into the hills on its way east to Preston, a train trestle used to pass over the road. 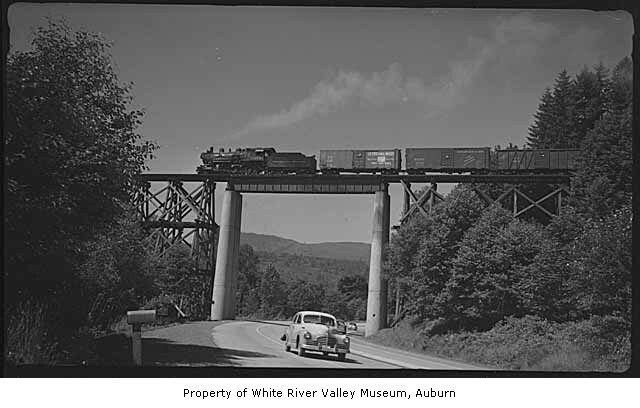 I don’t recall ever seeing a train on it, but the bridge was there until 1975, my thirteenth year, when it was removed so that the highway could be widened into a freeway. A few yards east of where this trestle was the highway crossed the East Fork Issaquah Creek, which drains Tiger and Taylor mountains, two of the ancient mountains that the sylvanophile and hiking-book author Harvey Manning named the Issaquah Alps. “Northern Pacific Railway’s North Bend Local at Issaquah, 1955”. To reach our fishing hole we parked right about where this photo was taken about a dozen years earlier. It is certainly dangerous and probably illegal now to pull off the freeway unless smoke is coming out from under your hood or your tire is flat, but in those days a man might without worry pull his old but well-cared-for ’57 Chevy wagon over to the side of the highway early on a Saturday morning and leave it there, leading his young son a few yards through the damp understory of salal and sword fern to the creek’s edge, where the bespectacled and fretful lad would have a hard time casting his fishing line into that deeper, darker water just behind big boulders, which is where — his father said — the fish were resting on their journey upstream. I don’t know how many times we fished there, but my memory of the place seems to encompass multiple events. I also don’t know whether or not it was my first fishing experience. I think not. At least, I think it was not the first place I caught a fish, because there is a very clearly tagged memory in my head of a place — God only knows where, now — called Helen’s Cove, a place of morning sun on the shore of what I remember as a good-sized lake, where there was a fishing dock, and where my sister Jeni and I fished side by side under my father’s tutelage, and where for the first time in my life I saw my pole, which was not in my hand because I was jumping around on the dock at that moment, I saw my pole begin to wiggle and the red and white plastic bobber out in the lake to dip under the surface of the water, and my father shouted to me that I had a fish on and told me to reel him in, and I did, and it was a perch, and it was the first fish I ever caught. “Perch”. I never forgot that word or that fish. I believe that the morning I’m thinking of now was sometime after that sunny morning at Helen’s Cove, and I believe we caught some trout this time. I remember the fact that the highway crossed the creek because I remember being almost directly underneath the bridge, standing on wet pebbles reflecting a grey sky, when my father kneeling at my side showed me how to smack the fish’ head smartly against a rock so as to kill it quickly. I don’t know that dispatching the fish like that bothered me much at the time, but I do know that I have never forgotten that moment. I thought of this a few weekends ago. Mara, who is now eight, has told me once or twice that she wanted me to take her fishing. While looking for a fun weekend thing to do on a Saturday morning that promised to warm into one of the last beautiful Saturdays before the darkening of the season, I found Old McDebbie’s Farm and Jim’s U-Fish online. Old McDebbie’s was a petting farm in Spanaway where kids could ride ponies and feed pigs and goats and donkeys (and a camel), and hang out in the barn petting kittens. There was also a pond there stocked with rainbow trout. We piled into the car. It turned out to be the perfect place. Spanaway is south of Seattle an hour and a half or so depending on traffic, and the farm was a little further south, just off Highway 7. It wasn’t so much a farm — no agriculture was being undertaken there that we could see — as someone’s 10-acre rural backyard, into which every rural or outside activity a kid might like to engage in had been provided for. At first blush it seemed a little cheesy for a farm — a putt-putt golf course would not have looked terribly out of place here. Fun, jokey signs and decorations were everywhere, and there were picnic tables and benches here and there around the spacious lawn, which was green and lush. A fountain feature burbled into one of the two ponds at the back of the property near the woods. There was a playground with swings and a play structure, and there were lots of outside games around, like bean bag tosses and hula hoops and the thing where you toss two bolo’ed balls at a ladder of horizontal bars in hopes of wrapping the balls around the highest bar. Angela and I looked at each other a little dubiously; we tend to value authenticity highly, sometimes perhaps too highly for our own good, and we were expecting more of a working farm that happened to have also some accommodation for little people. The carnival atmosphere made our artistes’ hearts quail for a moment. But the girls loved it and they loved it immediately. It turned out to be the perfect adventure. A fin gets you in, no matter your age, and although almost everything you do costs extra, I considered it a good value because the place was such a rich condensation of fun and hands-on furry activity for the kids (note: there’s no food concession here, so bring your own picnic lunch unless you want to eat candy). Both girls took a pony ride (another $5 each), Mara on Dotty and Millie on Henry, once around the ponds led by one of the helpers there. We fed the animals in the barn ($3/bag of scraps), which was kinda scary. The larger donkey bruised my thumb trying to chomp the stick of celery that I was feeding to the smaller one. One little girl got bit by a pony. In the barn at least, the farm experience was authentic. 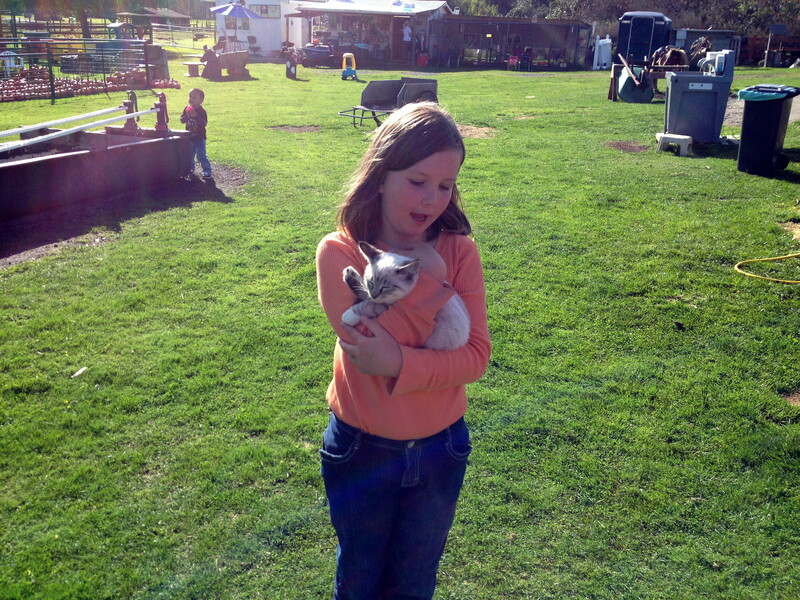 Millie sensed the potential danger and didn’t want to feed anything larger than a hamster. Mara bonded with some of the barn cats over the course of the several hours we were there. 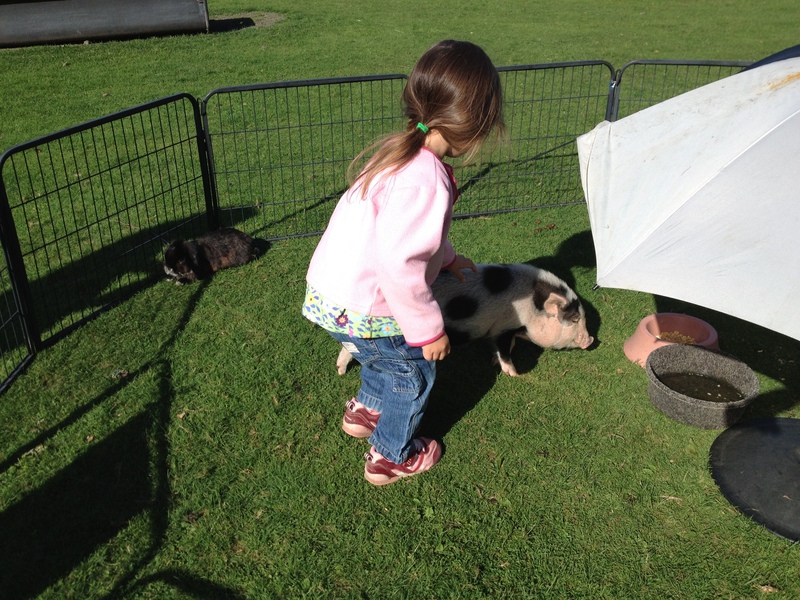 A baby pig was penned in a little circle of fence right in the middle of the yard, with a little umbrella for shade and a sleeping black rabbit for company, and small children who might be intimidated by the full-size pigs in the barn were invited to get inside this pen and pet the piglet. 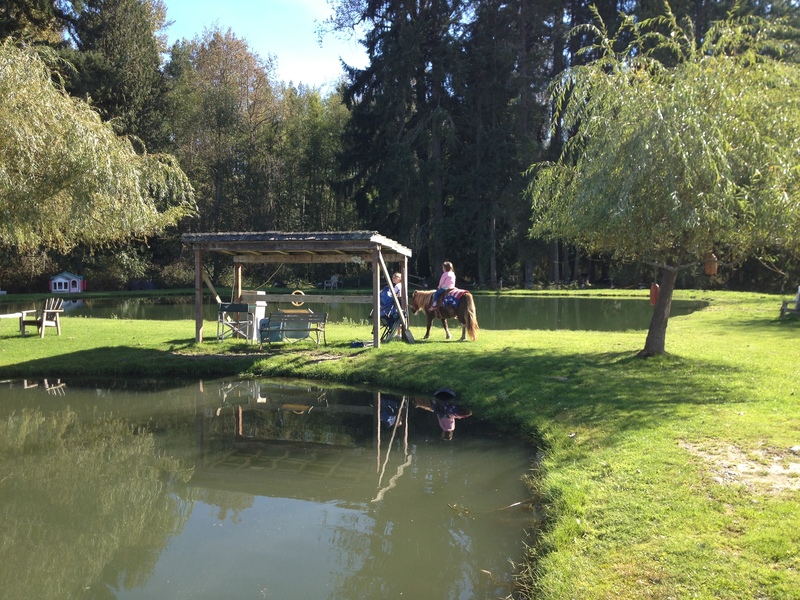 The responsible child leads Millie around the pond on Henry. The girls had a gas. They got to hear the donkey bray, which was a really unusual sound, and the goat kids bleat, which was another really unusual sound. I imagined that a lot of the sounds Millie has been told animals make in her books were that day realized in a new, first-hand way. I say “meh-eh-eh” when I’m reading her a book with goats in it, but the real thing is the real thing, and it’s easy for adults to forget that until you hear the real thing, you have not heard a goat bleat. Then we fished. I rented poles from Debbie at the gift shack ($2 per pole includes one baited hook, which should do for several hours of fishing; additional bait extra) and we took the girls to the pond’s edge. Fish were jumping out of the water every minute or two, as though they had been trained. It seemed unreal. The hook came with a brightly colored green or orange ball on it, which was supposed to attract the fish, although I don’t know if it was actually food. The lines had no bobbers, which confused me at first. 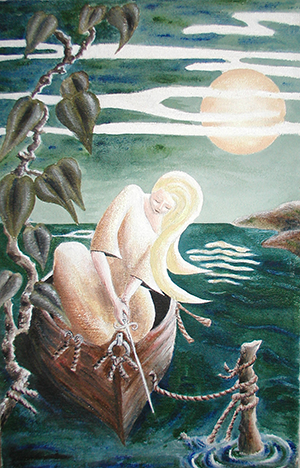 The girls could not cast the lines; I had to do it for them, and it took me an embarrassing dozen or so tries — during which both girls began to get bored — before I could successfully get that hook to sail out over the pond. Debbie had said that the fish liked to hang out in the cool water down deep, so let the hook sink a ways before reeling it in. Millie’s first fish. Fun, she’ll aver, except for the killin’ part. So I cast out for each of the girls, then we let the lines sink before the girls began reeling them in. Bingo! 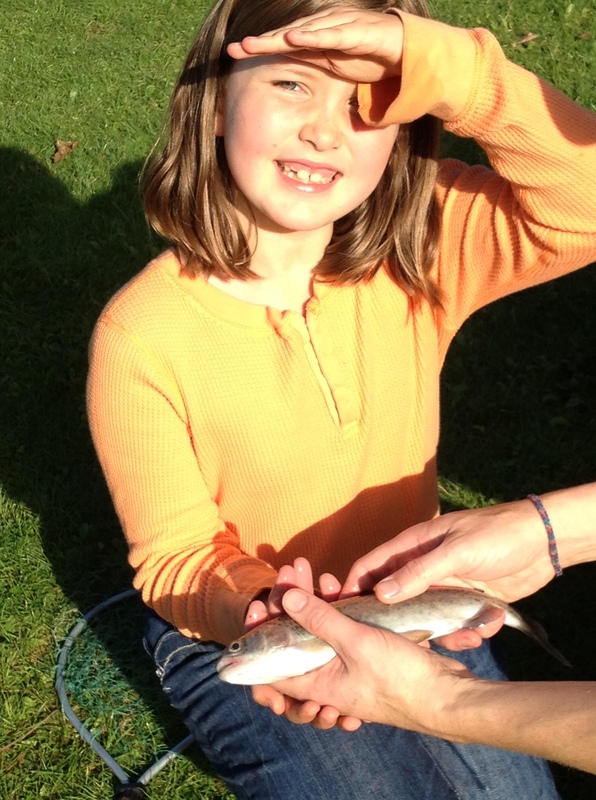 Within about four casts, Millie caught a fish. Millie caught a fish! 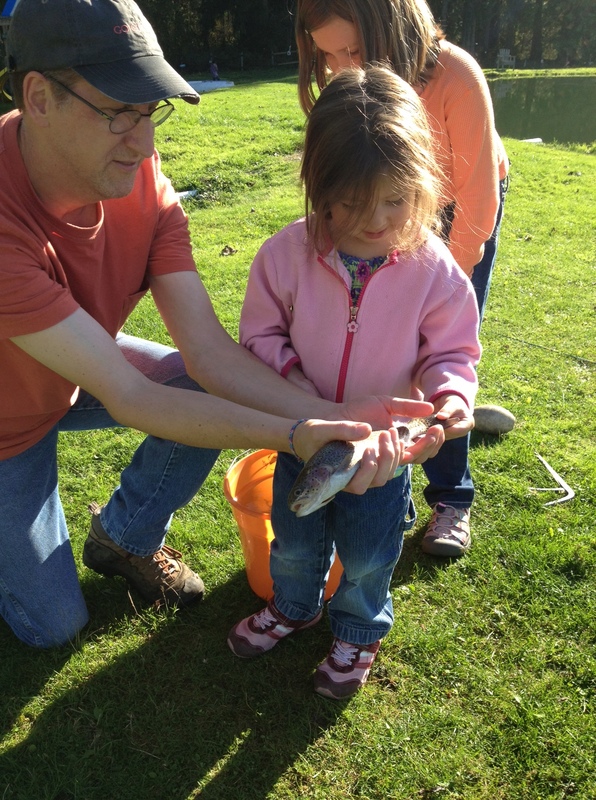 My three-year old daughter caught a fish! She was actually holding the pole when it bit, and Angela helped her land it on the grass. This was where things started getting sad. I got the hook out of the fish’ mouth pretty quickly, and lo, there was a large smooth rock protruding from the grass at my side, just begging for a fish to be brained on it. My impulse was to smack the fish quickly (as I had been taught by that venerable fisherman, my father), but the girls were right there and I had until then failed to consider how this execution might affect Millie. I asked Angela to take the girls away a few yards — a gross dereliction of duty on my part, I now realize, since it was hiding the truth — and I beaned the unhappy pond-dweller on the rock. It’s difficult to hold on tightly to a fish in any weather, but when you’re trying to swing it like a hammer it’s particularly challenging, thus I think I only stunned it the first time, so that its side fins fluttered like butterfly wings. It was over in a few seconds, but I felt like the suburban desk pilot that I am, and also a death-bringing ogre. Mara’s first fish. This one was still jumpy. If you look closely you can see the fishing line running into its mouth. Angela took Millie to ask Old McDebbie what we should do with our fish, which I’d put in a bucket with some pondwater. We wanted to keep it so I could cook it up at home. The rule was you had to either take any fish you caught with you ($5) or donate it to charity via the farm (still $5). There was no throwing maimed fish back into the pond. I was worried Mara would feel left out if her little sister had caught a fish and she had not (this turns out to have been more my worry than Mara’s, as usual), so I kept casting Mara’s line out, and bam! it wasn’t more than three more minutes before Mara’s line dipped and she reeled her first fish in. I helped her land it, but the hook was deep and I couldn’t get it out because the pliars-like implement Debbie had given us would not close fully, and I didn’t want to whack the fish with the hook in — not only did it seem, well, not cricket somehow, but it also seemed dangerous, since the fish kept flopping in my hand and I didn’t want to get the hook through my palm. Eventually I carried the writhing fish and the line and the bucket with the other fish (the dead one) over to Debbie’s shack, where she removed the hook (with a better set of pliars), and after asking me whether I wanted to cook it with the head on or off, took the fish to an outdoor washtub and sliced off its head with a knife while it was still alive. I inwardly cringed. In another instant she had gutted it and scraped out its entrails. She was busy talking about the 10-year-old girl whom she had hired to help her that day, how the kid was better than any teenager you could hire; more responsible, more alert, better with the animals, better with the customers. I was thinking that by rights I should have cleaned the fish. In the tradition handed down to me (this part by another fisherman, my friend Jeff’s dad), you clean your own fish. 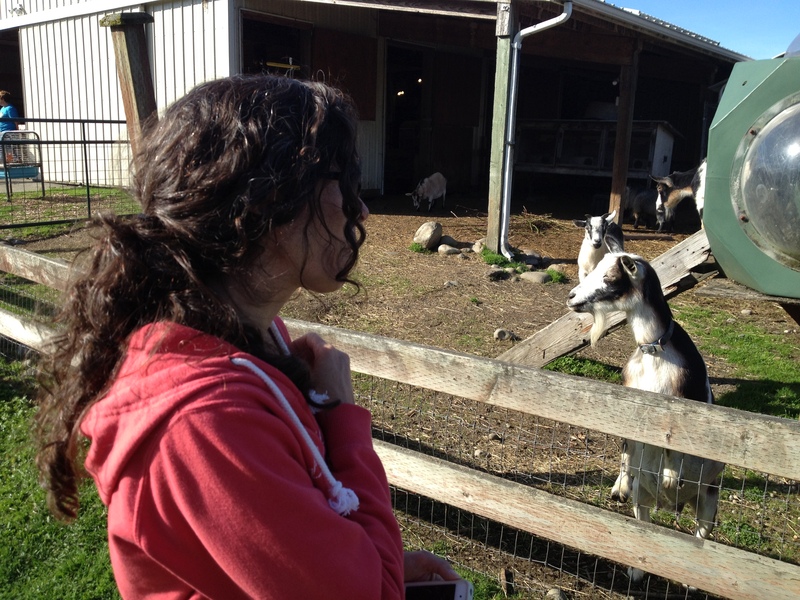 Angela is known to have a soft spot for an old goat. This is not that goat. Angela was rather dismayed by the whole affair, and anyway didn’t want me to cook the fish in the same iron skillet I use to make Dad’s Sunday Morning French Toast. “Get another skillet for savory,” was all she said while making a face, and I could tell she’d have been content if the whole fish thing had never happened. The next day I bought another skillet, googled “how to cook trout in an iron skillet”, and went to it. Flour, butter, oregano, some dill, a squeeze of lemon, and the magic of hot iron. We thanked God for the fish and thanked the fish for laying its life down so we could eat, then tucked in. Angela and I agreed that our scaled friends made a good meal. Mara tried it and was not strongly put off, which is to say she ate more than her “no thank you bite.” Millie abstained entirely, and was later heard to say “I wish we didn’t have to kill the fish so we could eat,” this a delayed response to the conversation that Angela and I forced upon the girls about the uncomfortable truth that something — animal or vegetable — must perish in order for us to eat. Here is one of the wishes I have that will remain an unfulfilled wish as long as I live: I wish that while my dad was alive I had asked him to tell me more details about the places where we fished, what fish we caught, and how we caught them. The business of teaching your children to fish, it strikes me now, is an enterprise to which you want to bring the full collective knowledge and traditions of your tribal ancestors. My dad’s fishing lore would have been a treasured link to my forebears, a bridge from the present to an eternal past. Its loss is like the pulling down of the old railroad trestle at Issaquah, which removed a historic path between two sides of a valley forever but escaped my notice until years later, when I peered out the back window of the family car and wondered what trick my mind was playing, whether this could really be the place I was thinking of. I could be on the topic of my sister’s death for a while. I’m ready to talk about it. So you may want to come back in a year or two if you’re in an up phase and don’t want to be brought low. I was doing the dishes one day recently and became aware that Millie, who is three and was sitting at her place at the kitchen table having a snack or drawing or something, had begun saying something interesting about her imaginary friend. “My friend knows how to get people out of heaven. She has a pick-up sword,” she said in that off-hand way that kids have of saying things when they are also peeling crayons or grapes. “What is a pick-up sword?” I asked, suddenly alert. Setting out for heaven? Painting by Kaia (www.kaia.ca) used by kind permission. I wish I were super special.